"The whole audience jumped to their feet with rapturous applause instantly, such was the effect this show had." From first to last the show is a non-stop, revved-up executive coach packed with energy and crammed with laugh-out-loud comedy that will have audiences lost in their own little time capsules of reminiscence, as the kids from Mrs. Kay’s Progress Class are let loose on the world – okay, Wales – for the day. The adult members of the cast clearly love every second of being on stage – with Michael Starke’s Ronnie The Driver’s entrance, Andrew Schofield’s curmudgeonly Mr. Briggs and Gillian Hardie’s super soft Mrs. Kay worthy of the admission price alone – but its the kids that sparkle. Drawn from all corners of the city, this show illustrates definitively what Liverpool and The Royal Court are recognised for, nurturing talent, and proves that the acting, singing and dancing future is in safe hands. Abby Mavers and Chris Mason as Carlene and Reilly are outstanding as the “love interest”, Mia Molloy has a singing voice to die for as the lonely Amy and Sinead Thompson and Kelly Forshaw have the ubiquitous bored teenagers off to a tee. Indeed all of the youngsters are just so enthusiastic it glitters in the performances and so sets light to the blue touch paper that powers the entire production to the heights. With songs and music that have toes tapping forever and with an astoundingly simple yet highly effective set that brings the utmost out of piles of empty boxes, Our Day Out – The Musical is one show that surely has “West End Hit” scrawled all over it. 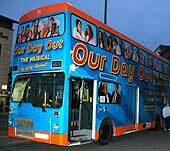 Playwright Willy Russell and director Bob Eaton can be credited with a fantastic new musical production of Our Day Out. It’s outstanding from the moment it opens right until the final curtain. Originally written in 1976, Russell’s play about a school teacher’s progress class, who are promised a day out to Alton Towers but are taken to North Wales instead, became a TV hit. The basis of the story is still the same but the introduction of mobile phones and - often quite shocking - language spoken between the kids, making up the chorus, are some of the modern additions to the updated script. Gillian Hardie plays the teacher with a sense of fun, Mrs Kay, while Royal Court regular – Andrew Schofield – plays the tweed-wearing teacher of discipline, Mr Briggs. Two teachers we have all experienced in our lifetime. Both are superb, although Schofield proves again he is a genius of comical timing and his transition within the production keeps your eyes glued to the stage. Even the animals used for the zoo scenes are ones of note. I was informed the hen was the first ‘celebrity’ animal to appear in a Royal Court production having appeared in BBC soap Doctors. A clever use of boxes create a simple set which changes from a bus, school and beach, enhanced with a projection screen at the back of the stage. But Russell and his team have unearthed over 25 kids for the chorus who can all perform at a level quite outstanding. From Caitlin Evans’ cuteness to Mia Molloy clutching at your heart as a young girl from a volatile home, to Sinead Thompson and Kelly Forshaw, as two girls who find everything “borin’”, and the dance movements from Stephanie Davis, Rio Samuels and Josh Wharmby. All were excellent. Michael Starke brings experience to the stage as Ronny the coach driver and gets to sing and dance with the ‘Boss Of The Bus’ number in the first act. ‘We’re Off’ and ‘Scream If You Wanna Go Faster’ were other catchy songs written into the script and ‘Beach Boy’ performed by Holly Quin Ankrah (as supply teacher, Katie) in a move to scare off class bully Reilly (Chris Mason), had those in the auditorium transfixed. And looking at the expressions on the kids’ faces as every single member of the audience were on their feet in rapturous applause at the end, you could sense an immense pride and they have every right to be proud. They were simply the best. 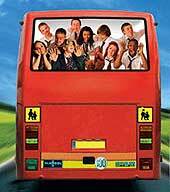 THERE are two abominations in this world: coach trips and musicals featuring precocious kids. The former will always be associated with the combined smell of sick, egg butties and midgets in front, cranking the seat back to crush the kneecaps, to create even more waggle-space for their little limbs. The latter conjures up an image of Junior Showtime-era Bonnie Langford lookalikes in Meet-The- Gang-Cos-the-Boys-Are-Here footlights mode, shrieking that atrocity “Tomorrow”, from Annie. The horror, the horror, as Colonel Kurtz would have said, before blasting the aforesaid midgets and Bonnies to death with an Uzi. 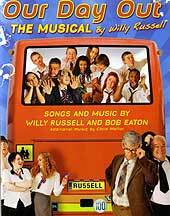 Willy Russell's musical adaptation of his own TV drama, Our Day Out, contains these elements - ie coach trips and singing children, but in this incarnation the experience proves one not to be forgotten - for all the right reasons. In short this is an absolute stonking triumph, arguably not only the most ambitious but satisfying of the Royal Court's laudable commitment to fostering home-grown talent. For those not in the know, Our Day Out, was originally a pure narrative tale penned by former teacher Russell, first screened in the BBC's Play for Today slot, and to almost universal acclaim, in 1978. It centres around an eventful rites-of passage school trip to Wales involving Mrs Kay's Progress Class, a gang of deprived adolescent Liverpudlians who, it can be safely assumed, have never been further afield than the bottom of their road, never mind to Conway Castle. It's been a popular perennial with drama groups ever since, but Our Willy always felt that there was unfinished business. So, as a proven songwriter and composer, as well as playwright, there have been dabblings with this as a part-musical production in the past. But this is the first time that narrative dialogue, has fully taken the back seat (bad pun intended) to allow the music and songs to flourish in a fast moving, two-hour production powered by Bob Eaton's direction. In short this is an absolute stonking triumph, arguably not only the most ambitious, but most satisfying of the Royal Court's laudable commitment to fostering home-grown talent. Supported by the expertise of the theatre's musical director, Howard Gray, and an extremely tight six piece backing band squeezed into the stalls, this marks an almost faultless, full blooded dive by Russell - together with Eaton - back into the compositional sea, with songs which pulse with wit, poignancy and sometimes laugh-out-loud hilarity. Favourites among a few proved to be I'm In Love With Sir, opined by lovelorn scally girl Carlene, played convincingly by Abby Mavers (sample line sung in sing-song scouse: "I'm In love with Sir, But Sir doesn't care. Cos Sir's in love with her, over there, with the hair, bleedin' mare...") and the wistful No one Can Take This Time Away, sung by Mia Molloy, that received deserved, thunderous applause. Kelly Forshaw and Sinead Thompson also brought the house down as the joined-at-the-hip, misery-moo pupils whose continual catchphrase and accompanying song is "Borin' its bleedin' borin'." Abby, Mia, Kelly and Sinead, were part of the excellent young cast chosen from an auditioning team that included, perhaps most importantly, choreographer Beverley Norris-Edwards. She was on the look -out to sift out raw talent from pre-programmed happy-clappy Bonnies who one can imagine, had their pushy, mouthy, mums glowering, arms folded, in the background. The result is an adventurous, boisterous but well co-ordinated juvenile romp around an economical but inventive set which had the Court alternately purring with pleasure and snorting with laughter. And lest we forget there's the adults who don't entirely have the show stolen away from them. But it was the kids and the songs which were the stars, a factor which the adults would surely not begrudge them. If Billy Elliott can win a host of awards there's no reason why this gem of a musical can't follow suit when its debut run in Liverpool ends in mid-October. Catch the bus while you can. Our Day Out makes for a Great Night Out. 9/10: “Borin', bleedin' borin'” it most certainly ain't. IT’S been an integral part of Liverpool childhoods since the first BBC screening 30 years ago. That film of Willy Russell’s Our Day Out has spawned hundreds of school productions as well as two previous stabs at transferring it to the big stage - both headed by director Bob Eaton. Now Russell and director/co-writer Eaton are back with what’s being billed the all-singing, all-dancing definitive musical version of the tale of feisty teacher Mrs Kay (Gillian Hardie) and her “progress class” on a day trip to Wales. It’s a day punctuated by shouting, flirting, a touch of cartoonish pilfering of poultry and prophylactics, and plenty of fun. But of course in the process everyone learns to be more tolerant of each other - even Andrew Schofield’s rule ’em with a rod of iron teacher Mr Briggs. The opening sequence stretches to a rather lengthy 20 minutes, albeit packed with hustle and bustle as the children prepare for their day away from class. With the quickfire numbers and large cast on stage it could all get a little chaotic. But the experienced production team keeps a firm and generally immaculate hand on the steering wheel. And ultimately, hands up who can possibly resist the charms of this feelgood show? Even the most curmudgeonly should prepare to be swept, smiling, along on a wave of exuberance and the sheer confidence of the young cast, some of whom have never acted before. Whereas previous stage incarnations of the show have featured the odd number, this is packed with music, the dialogue playing second fiddle to the songs. Russell, Eaton - and musical director Howard Gray - have pillaged a host of musical forms with admirable chutzpah. Michael Starke gives his best Al Green/James Brown impression in a gospel and blues-infused Boss of the Bus. Elsewhere there’s a burst of rap, while I’m In Love With Sir has Abby Mavers’ lovestruck Carlene Croxley swept into a glittering Busby Berkeley fantasy with object of her affection Mr McDevitt (Bradley Clarkson). Meanwhile teacher Katie’s (Holly Quin-Ankrah) seaside siren rendition of Beach Boy probably isn’t within Department of Education guidelines but is hilarious. Designer Ellen Cairns avoids the constriction of backdrops and a real bus by the clever use of boxes to form the changing scenic landscape, and there’s impressively tight, bright choreography from Bev Norris-Edmunds. IT'S obvious from the off that this production is a brave move by the Royal Court. The old cliche of not working with children or animals has been thrown out the window. For Our Day Out, they have taken more than 30 teenage performers, some live animals, a sprinkling of professional actors and then thrown it all together on the stage for a musical. But director Bob Eaton has managed to put together a show that loves to cause a little mayhem while keeping itself suitably composed, both musically and theatrically. Willy Russell's Our Day Out, based on his 1976 BBC play, follows a gang of schoolchildren who are excitedly getting ready for a trip to Alton Towers, that is until grumpy teacher Mr Briggs, played wonderfully miserably by Andrew Schofield, decides to take them to Wales instead. As you can imagine from a show which covers a group of unruly kids on a day-trip there's a high level of energy on stage and this Royal Court Production captures the pains of growing up perfectly. The cast are on stage for the majority of the running time and, when the animals are brought on, it's incredibly frenetic, as a simple set consisting of boxes changes from a school, to a bus and even a beach. But no matter how madcap the stage, a musical lives and dies by its songs. Director Bob Eaton has worked again with Russell on a new version of the song sheet. We're Going Out Today and We're Off have a great catchiness to them. The script has also had a bit of spit and polish to bring it back up to date, with mentions of mobile phones and digital cameras keeping everything fresh. The dialogue is genuinely funny too as the children's playground chat bounces off each other and Russell's script is as relevant today as it was more than 30 years ago with a degree of poignancy in all the right places. The professional elements of the cast have a lot to do to keep the focus of the show, but with confident hands such as Mickey Starke, who places the type of bus driver we all remember from our own school trips, they are able to keep the laughs coming while giving it the necessary drive. The result is a madcap, exciting and busy comedy. It's not for everybody, the bad language coming from some of the characters will shock a few, but there's plenty happening and the young performers are able to sing and dance with the right amount of skill and gusto. It feels like a big production and certainly enough to show that the theatre has taken this brave idea and pulled it off. This show is an absolute must see for those who have enjoyed the style of story that Willy Russell has become famous for with the likes of Blood Brothers, Shirley Valentine and Educating Rita. For the majority of the first and second acts I laughed so much tears were pouring down my face and my stomach hurt. However, just when you least expect it, Willy Russell manages to stab you in the chest with a heart-wrenching twist to the storyline that changes tears of laughter to those of sadness. The songs varied in style from rap, hip-hop and rock n roll numbers to slow ballads. The song lyrics delivered in broad scouse accents were injected with so much humour, it made concentrating and listening to every word so much more important and enjoyable. The 20+ strong cast of young people all aged 12-18 were simply fantastic, their rawness, their energy, enthusiasm and passion came across so strong, it was infectious. What was clear was how much they seemed to be enjoying singing, dancing and performing it! I had the privilege of seeing the ‘Red team’ and they were all superb, particularly the smaller ‘solidly’ built lad and the ginger haired boy who had great facial expressions!! I also liked the two girl ‘clones’ who described everything as “it’s boring, it’s bleedin’ boring!”. I’ve worked with a few kids like them in my time!! The girls who played Carlene & Jackie were hilarious, particularly the former who had a crush on her male teacher and sang “I’m in love with sir...but sir doesn’t care...cos sir’s in love with her...over there...with the hair...the bleedin’ mare”. (In Scouse pronunciation...sir/care/her/there/hair and mare all rhyme perfectly!!). In the second song ‘We’re Going Out Today (with Mrs Kay)’ the school bullies Digga and Reilly taunt the ‘Progress Class’ calling them every offensive term imaginable. The class move to the song jerkily, transforming their bodies quickly, almost robotically and charicaturing extreme deformity style handicaps. They respond repeating lyrics like “We can’t be arsed!”. It may sound a bit un-PC, but it was actually incredibly funny!! Then there’s Les (the blind!) lollipop man whose total incompetence and choice language towards the kids is brilliant! I had read the play a number of years back and remember reading the directors notes about using stuffed toys as the zoo animals, so when the kids turned around and actually had REAL animals in their hands, both I, and the rest of the audience gasped in surprise! Thankfully they didn’t let go of the snakes though!! The set was simple, but extremely effective. Video projections and simple props contributed well. What it lacked in effects and scenery it by far more than made up for in a cleverly written, witty and well performed storyline. The finale song ‘No one can take this time away’ was extremely moving and the CD was on repeat in my car journey home. The whole audience jumped to their feet with rapturous applause instantly, such was the effect this show had. I have just booked to go again and I recommend this show to anyone!